St Thomas More had no answers as they fell to Lennox in the opening round of the Girls Class A State Tournament Thursday. SIOUX FALLS, S.D. 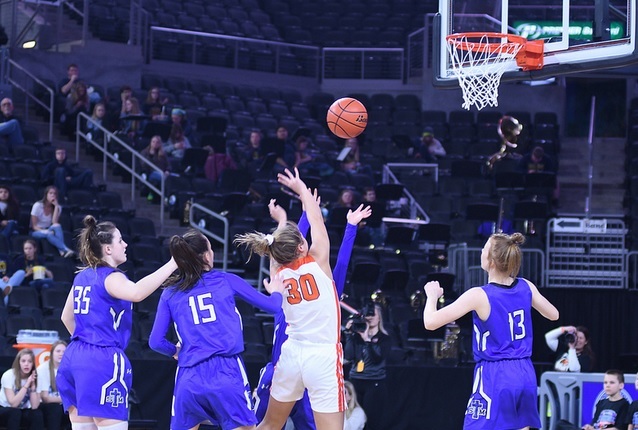 - The St Thomas More Cavaliers will not repeat as state champions this year, falling 49-27 to Lennox on the opening day of the South Dakota Class A Girls Basketball Tournament. The Cavaliers fell behind early, and got outscored 15-0 in the second quarter and 15-4 in the third. Rianni Fillipi led Lennox with 16 points and 5 rebounds. The Cavaliers were led by Haleigh Timmer's 15 points. In other scores, Winner snuck past Aberdeen Roncalli 59-55 and West Central outlasted Mount Vernon/Plankinton 50-46. In the fourth game, McCook Central/Montrose beat Todd County in a high scoring affair 80-75. In Friday's semifinals, West Central will play Lennox and Winner gets McCook Central/Montrose. St Thomas More will play Mount Vernon/Plankinton in the consolation semifinals.